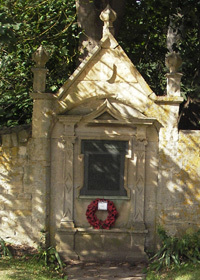 The main war memorial is located in the boundary wall of Stanton Court, in the centre of Stanton, Goucestershire, England. Pray for the men of Stanton who gave their lives in the Great War Ad:1914-1919, to whose memory the village has dedicated the new cross. QMS C. Arkell Coldicott Warwickshire Yeomanry. Tpr Harry J Coldicott 4th Australian Light Horse. Lce Cpr Arthur Ernest Evans 9th Battn Gloucester Regt. Segt Robert Harrison 7th Battn Gloucester Regt. Pte Edwin Holmes 10th Battn Gloucester Regt. Pte Jesse James 13th Battn Gloucester Regt. Pte Frank Stanley 6th Battn Gloucester Regt. 2nd Lt Philip Nicholson Stott 10th Bn Manchester Regt. QMS C. Arkell Coldicott. His full name was Charles Arkell Coldicott. Tpr Harry J Coldicott. The initial J is incorrect. It should be an I for Harry Izod Coldicott. 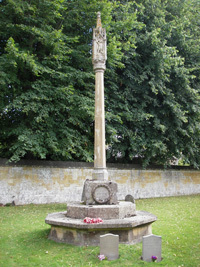 A new cross was also erected in their memory in the churchyard. Both memorials give the dates of 1914-1919. Pray for Philip Stott and all those of this parish who have laid down their lives for king and country. The elaborate oak rood screen is also dedicated to Philip Stott. There is an additional marble plaque with the Welch Regiment Badge above the text, and RFC wings below. In loving memory of a faithful soldier. CLEMENT ROBERT WEDGEWOOD-ALLEN. Captain in the 2nd Battalion Welch Regiment and flight commander no 3 squadron Royal Flying Corps. Killed whilst flying in discharge of his duty on March 11th 1914 aged 35 years. Quit you like men be strong.